Pushing toothpicks into styrofoam is a great fine motor activity for kids. However, it's kind of, well, plain. Nor does it lead to much imaginative play. So here's my winter themed spin on the classic toothpicks and styrofoam activity: a winter fine motor village! While perusing the dollar store, I came across some Christmas themed party picks. There were red Christmas bells, blue snowflakes, and green Christmas trees and came twelve to a pack. So I picked up one package of the trees and one of the snowflakes, but had no idea what I was going to do with them. Then I thought about little Christmas villages and how fun it would be to make our own little village using the picks and styrofoam. There was only one small problem. I didn't have any buildings or snowmen or other village type accessories that would work for the toothpicks and styrofoam activity that I had in mind. So we made our own! Using cardstock, I drew two houses and a little toy store. They each have Christmas lights on them, just to make them more festive. Then I cut the houses out and taped them to a toothpick. I also drew a bunch of snowmen shapes on some cardstock. I added the details onto one, but J drew details onto all the remaining snowmen. Then I cut them out and taped them to the toothpicks as well. Cute, right? Here you can see the other house and one of J's snowmen. J happily created a little village using all the different picks. After using all of the picks, J started reorganizing them to create a winter forest around one particular house. He even moved all the snowmen to huddle around the house, trapping some poor person in his little house. Just kidding, no imaginary house dwellers were forcibly confined during this activity. Then J had to stop and admire his work...very closely. And did you notice the green dinosaur toy lurking in the background of the photos? It was just waiting to plan its attack on J's village. I bet you want to scroll back up and look for it now...go on...you know you want to. Looking for more fun fine motor activities? 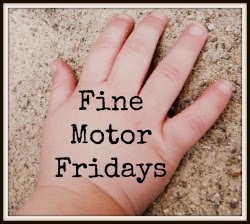 You can check out the rest of my Fine Motor Fridays posts here. Now go check out the other fine motor activities that my partners in crime came up with. Awesome idea! I love the twist you gave to the simple toothpicks in styrofoam idea. 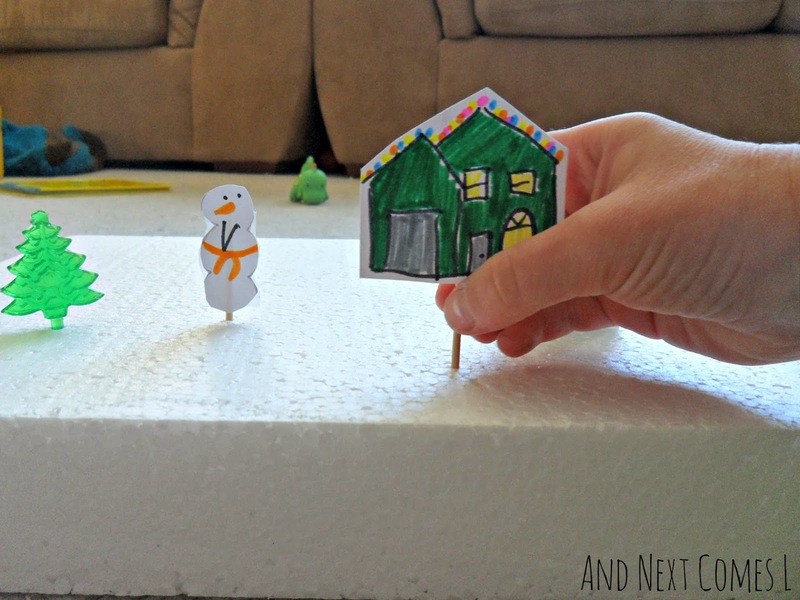 This winter village is great for pretend play - and so cute too! Thank you. It is definitely good for pretend play! Very cute! Caden loved a toothpick activity that I came up with last Winter! This is awesome! I think I need to find some of these! Even if you can't find any, remember you can always make your own! What a great idea for fine motor and pretend play! Definitely easy to make too! OMG I love this! I remember the little villages being so awesome as a kid! I love the cardstock houses with lights!! So great! I still love little Christmas villages as an adult! And thank you. How cute is this? I'm forever jealous of those who get to have a white christmas. Our Christmas is scorching hot and humid. I remember the one year when we had no snow on Christmas day. It was so weird. I love our snowy white Christmases! Great to hear. I say pin away! Little umbrellas! Oooh, I am thinking a beach scene variation of this activity would be fun! That is so cute! I totally want to play with it! I know the girls would have so much fun with this! They are currently obsessed with snowmen and snow themed play! My favorite part of this activity was J drawing adorable little snowmen!